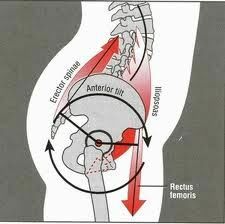 The psoas muscle plays an important part in our posture in general, and has a crucial influence on rider biomechanics. 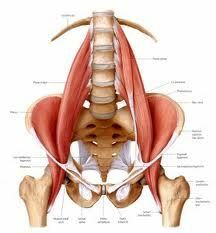 First let’s examine some general information regarding the muscle called the psoas, also referred to as the iliopsoas or hip flexor muscle. It is located deep with the abdomen, and originates along the sides of the vertebral bodies of the 12th thoracic vertebrae to the 5th lumbar vertebrae, and along the sides of the intervertebral spinal discs. The psoas muscle travels from deep in the abdomen to attach below the lesser trochanter of the femur (long thigh bone) which is located towards the inner thigh region. The iliacus (hence ilio-psoas) originates along the inner aspect of the ileum (the inside of the pelvis bone) and joins the psoas muscle in a common tendon, attaching again just below the lesser trochanter. Some different views of the ilio-psoas muscle and its attachments to the spine, pelvis and femur. How does the Ilio- Psoas Muscle function? The function of the psoas muscle is to bend the hip, which in essence brings the upper leg and knee upwards closer to the abdomen, a necessary function for walking standing and sitting, amongst many others functional activities. The psoas can also control the position of the spine as the upper body bends over the leg (bending forwards at the waist in a leaning position), and the psoas can assist with maintaining a neutral alignment of the bones of lower back. This is how the Ilio-psoas typically functions. However, here are some thoughts as to what occurs when the Ilio-Psoas becomes shortened in a restricted position. 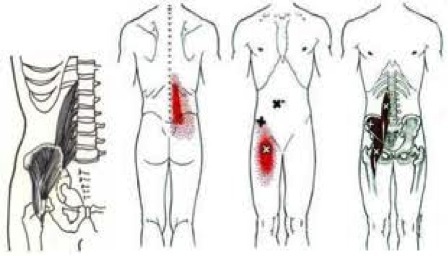 When the psoas is not flexible, and does not maintain its optimum length, it becomes shortened or contracted. When shortened in this way, it essentially holds the lower back in an arched or hollowed position due to the way it is attached to the spine. 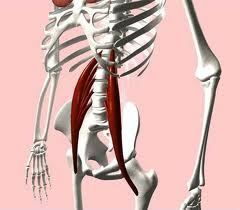 Typically, if this muscle is in this state of shortening, then the hip will be maintained in an external rotation. This translates into a rider posture with a hollowed lower back - the pelvis is tipped forward, with the seat bones pointing towards the rear of the horse. The knee is automatically held away from the horse due to the shortening of this muscle, and the toes are held in a turned-out position. See illustrations below. Effect of the contracted psoas muscle on the pelvic orientation. Above left: side view showing pelvis tipped forwards with seat-bones pointing towards the rear of the horse. The posture above gives the horse the postural cues to HOLLOW its spine and pelvis! Why is this Significant to Equestrians? 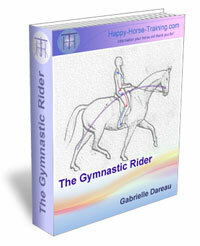 Since the ever-eluding goal is to become a fluid rider and to be able to accept, and ultimately influence the horse’s movement, then we also need to be able to lengthen our spine and tip our pelvis in various positions in order to be able to perform the same movement within our own body as we are asking within the horse’s body. 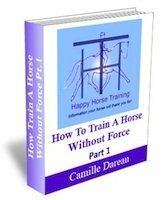 This also requires the rider’s lower back to be able to receive the movement from underneath it, coming from the horse’s spinal movements and the motion from the gaits. The human spine and pelvis need to remain in a neutral (not hollow) alignment at times, be able to open (stretch), and be able to bend side to side as a result of the horse’s movement of the spine, ribcage and legs beneath the rider. A taut psoas will keep the rider in a position that gives the horse the signal to hollow its own back (see above illustrations). As a rider, we may be thinking of cueing our horse to engage their pelvis and hind legs towards increased flexion and engagement, however, this would be a completely conflicting signal if we ourselves are not flexing our spines and tipping our pelvis into a more posterior tilt. It would be very difficult for the horse to tip (tuck) it’s pelvis, and lift it’s back in flexion, if we are sitting on them within a completely opposite posture of hollowed low back and a narrow base of support. During standing and/or sitting, both human psoas muscles are continuously slightly active, in order to assist with the positioning of the hip – pelvis – lower back, as the muscle crosses from the spine, to the abdomen, to the hip. While seated on a horse, this very same low level contraction of both psoas would be assisting the rider’s pelvis maintain a tucked pelvis, with maintaining a small neutral curvature of the spine and allowing the legs to essentially drape around the horse’s sides, providing a knee and foot forward position along with much more contact of the upper thigh with the horse, due to it’s flattened orientation against the horse. Right: the tucked pelvis, with more contact of the flattened upper thighs, the knees and feet pointing forwards. During walking, the human’s psoas is active during the initial swing part of the human gait stride while the opposite psoas muscle is considered most active during the mid-stance (weight bearing) portion of the gait. For just a moment, imagine, while you are seated on your horse, both iliopsoas muscles, are active while you are seated there to assist with your upright posture. Once the horse begins to move, right before the hind hoof on one leg goes to lift off, the human’s iliopsoas on that side would need to be lengthened enough to allow their own pelvis to drop down, and their lower back to bend (or open the joints) towards the same side, in a fluid motion towards the horse’s back and the dropping movement of the horse’s spine on that side. Meanwhile, the opposite human psoas muscle would be in a more shortened position, with a more elevated pelvis on that side from the horse’s weighted hoof and the horse’s elevated pelvis. These are the exact same occurrences as when the human is walking, and the psoas are typically functioning from one side to the other. In the human lower back and, more so, the human trunk, there is also the availability of differing amounts of bending to the sides (lateral flexion). A shortened psoas does not permit this side-bending to occur, as the lower back is maintained in a hollow (closed) position. Therefore, as the rider is seated on the horse, with a spine maintained in a hollowed position, the human’s spine is not capable of opening to allow the pelvis to be in neutral or tucked position (posterior pelvic tilt) while receiving the movement coming from the horse underneath them. This lack of side bending in a hollowed position would also create a jarring motion of the rider on the horses back, as the human’s spine is held rigidly, not able to lengthen and shorten. Also, when the hip is held in external rotation (knee turned out, and toes pointed out) from the restricted ilio-psoas there is less room between the back side of the hip (greater trochanter) and seat bones in the seated position. This lack of space between the hip bone and the seat bones, really narrows the rider’s base of support and increases the pressure point of the human’s seat bones onto the horse’s back. Therefore a psoas muscle that is flexible will allow the rider to sit with a wider base of support in the pelvis, with a pelvis that is held in neutral alignment, with the availability to tip the pelvis forwards or backwards depending on the manoeuvre, while maintaining an aligned low back with receptive ability to move with the horse. The upper leg would then be draped over the sides of the horse, creating more contact with the horse, the knee would be pointing forwards, and toes would also point forwards. There is a significant relationship between the human and the horse’s spine and pelvis. It is imperative for the human to be able to open their low back, stretch and activate their psoas muscles in order to encourage more fluid motion of their spine, pelvis and hip, and also start to increase postural engagement with the horse to influence his balance. This positioning is very much the same position we are asking of the horse during more engagement manoeuvres or what can be called increasing collection. Follow-up articles to this will focus on some stretching and activating exercises of the psoas muscle, and an article on the subject of breathing and core stability. Carol-Anne Robinson is a Registered Physiotherapist, CHA Certified Instructor Level 3 English & Western, and a Parelli Level 4 student. The Psoas muscle is an excellent example of the unique counter-balancing release and contraction of muscles that the rider needs to perform to both connect with the horse's movement and channel it into a new balance. 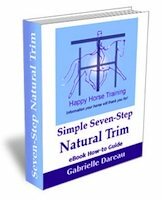 In order to transform the horse into straightness and balance, the rider must first form a deep and unwavering connection with the flow of movement generated by the hind-leg thrust. The release of the Psoas muscle allows the rider to let his/her pelvis down into the horse's movement in order to engage posturally with this forwards flow. 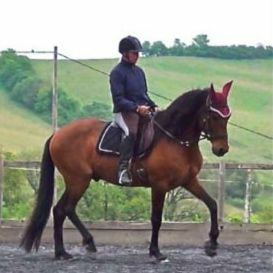 This allows the rider to lower their centre of gravity towards that of the horse, giving the characteristic 'grounded' and stable look of an accomplished seat. A contracted Psoas muscle, on the other hand, tilts the pelvis forwards and pulls the rider's seat up and out of the forwards flow of movement, instead propping it against it. This is one of the causes of the incorrect hollow or 'braced' back frequently seen amongst dressage riders. 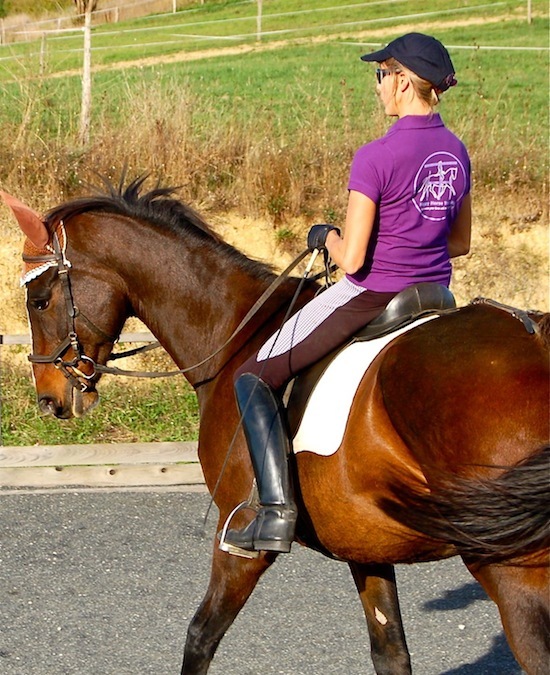 When the release of the right muscles, such as the Psoas, has allowed the rider to connect correctly with the horse, other postural muscles must come into play to both support the rider in this position, and to counteract the unbalanced forces created by the horse (e.g. falling in or out, running onto the forehand, rotation of the ribcage). These muscles, such as the abdominals and the rear-thigh muscles, do contract and work to maintain the balanced posture of horse and rider, at the same time as the all-important connection is maintained by the specific relaxation of others such as the Psoas muscle. In the same way as there is no point in working hard as a rider without being posturally engaged with the horse (because no matter how hard you work, you won't have any real effect), we cannot, on the other hand, just completely relax on a horse because we will quickly end up being formed by the horse's way of going instead of forming it. Riding demands a unique combination of these two actions - effort and relaxation - in a way that is not at all evident. The release of the Psoas muscle, a deep postural muscle that we are not normally even aware of, is an illustration of this. It is no wonder that genuinely good gymnastic riding, with no 'short-cuts' such as double bridles and spurs, is such a challenge, and so seldom seen.